Giraffes have a small hump on their back and have a spotted pattern similar to that of a leopard. For a long time, people called the giraffe a “camel-leopard” because they believed that it was a combination of the leopard. Each subspecies of giraffe has a different coat pattern. Masai giraffes are from Kenya and have patterns that look like oak leaves. Both male and female giraffes have two distinct, hair-covered horns called ossicones. Giraffes only need 5 – 30 minutes of sleep in a 24-hour period. Often taking quick naps that last only a minute or two at a time. Giraffes can rest while standing but they sometimes also lie down with their head resting on their rump. 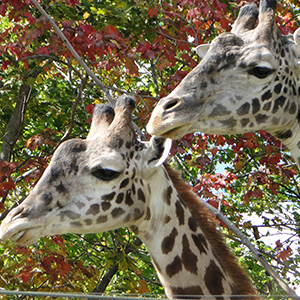 Giraffes may eat up to 75 lb of leaves per day. Their favorite leaves are from acacia trees. A giraffe’s eyes are the size of golf balls!